I’m taking an inspiration from my bacon wrapped pineapple mozzarella rings by combining my love of mozzarella and my love for hot dogs and hamburgers. Why not combine them and make them easy to eat in a hot dog bun? So whether you’re in the mood for a hamburger or a hot dog, now you can get to have both. And there you have the Hamburger Wrapped Mozzarella Hot Dog! 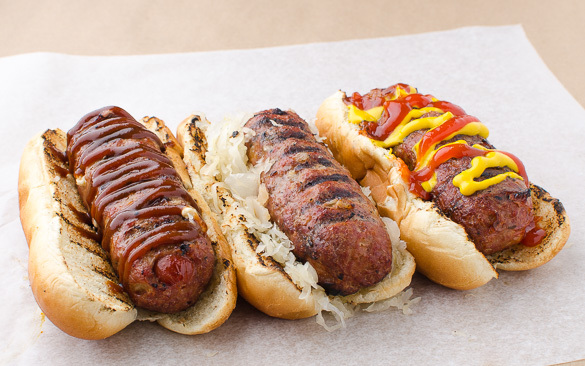 They are delicious with all the usual hot dog condiments like ketchup, relish, mustard, and sauerkraut. I just got back from my Chicago trip to teach at Weber so I think a Chicago-style hamburger dog with no ketchup but with cucumbers, pickled peppers, tomato, etc. might work. Maybe some slow cooked caramelized onions might be good also. 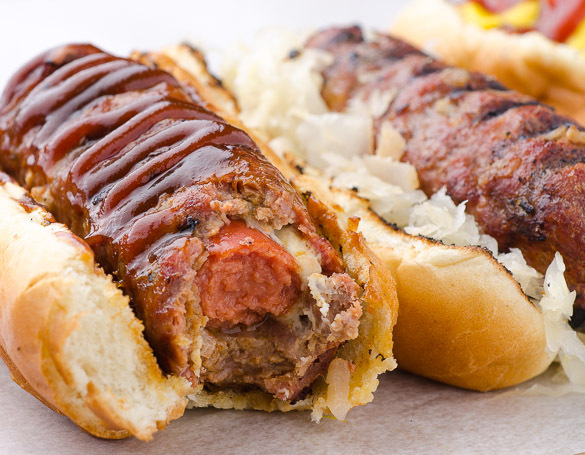 Splash on some barbecue sauce for a pitmaster twist. The important thing is to have fun and pile on whatever you like. 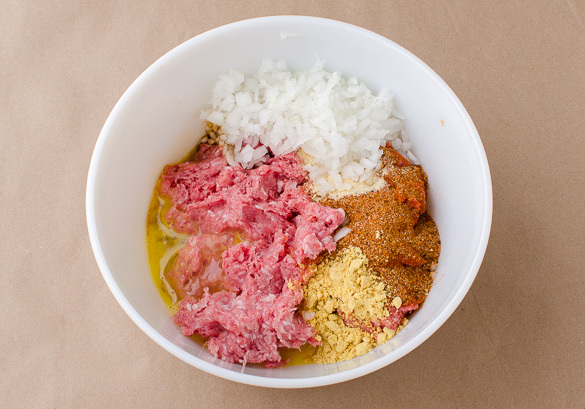 I added some ground pork and beaten egg to my hamburger meat to make it more juicy and easier to hold its shape around the hot dog and mozzarella. You can replace the pork with beef if you prefer. 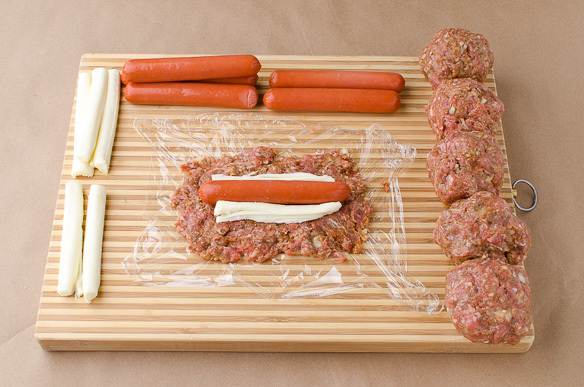 Place a hot dog in the middle of the meat pile. 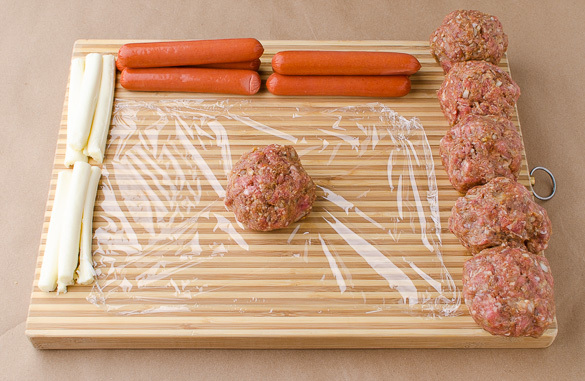 Carefully lift the plastic wrap and to mold the meat around the hot dog and cheese to form an approximately 1½ inch roll. 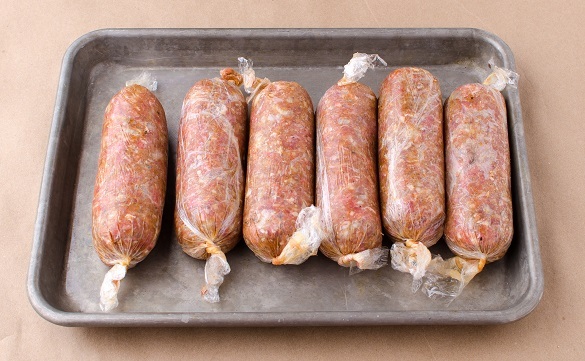 Twist the ends of the plastic wrap to hold the shape. Refrigerate to hold the shape and until you need to cook them. Remove the rolls from the fridge and unwrap the plastic. Place the rolls on the cool side of the grill and put some wood chips (or handful of pellets) on the hot side to generate some smoke as you want to smoke it first. Cook indirect for 30 minutes. 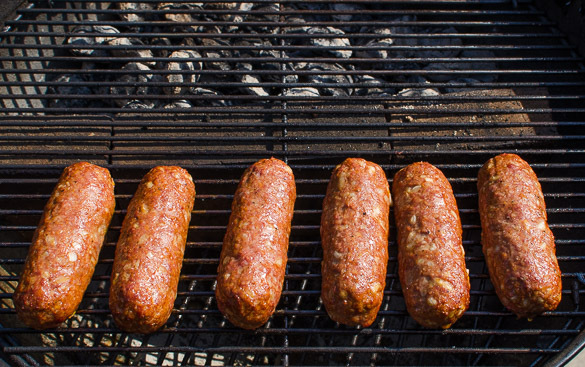 Then move the hot dogs directly over the hot coals for a couple minutes flipping once, to make some nice grill marks on both sides. 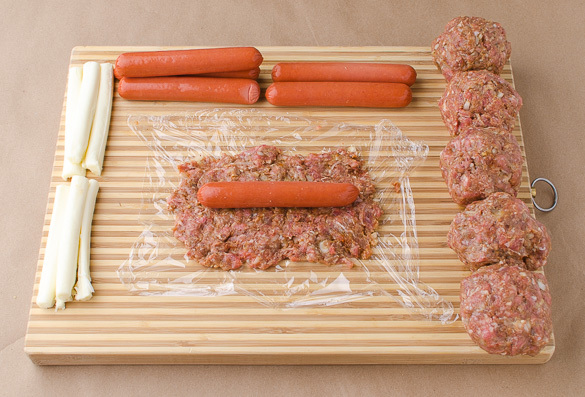 The hamburger meat is cooked when the meat thermometer in the ground meat area registers 160F. Harry…do you have bricks in the middle of your weber to disbpurse the heat for a hot and cool side?? Do you like a specific type of brick? Only a true man of fire know about these techniques. Two thumb and two toes up!! Yes, there are several ways to keep a hot and cooler zone in your Weber Kettle. You could use regular Home Depot bricks or get some Weber wings charcoal baskets. Or you can just mound your hot coals onto one side of your Kettle. Good luck! Harry, love your site! I saw this and had to try it once at least. 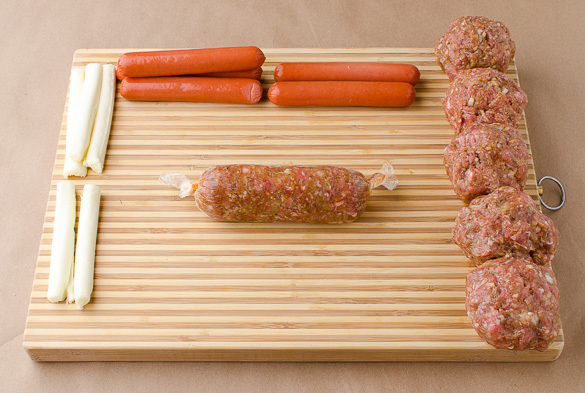 I used 1/2 ground turkey & 1/2 ground pork, then wrapped in a spiral with a strip of bacon. They turned out really great on a bun with bbq sauce! I think I got the meat layer a little thin because I lost a lot of the mozzarella on the grill, but I will definitely do these again. Bacon makes it all good!